Some of you know I am a connoisseur of patent drawings. A few years ago I made a blurb book of some of them. In the mean time I continued to find more. I just updated it, changing it to a magCloud 12" X 12" publication showing 4 per page with 48 pages. If you're interested you can preview and order it here at MagCloud. If you would like a signed copy go to the Dry Reading store. Here's the introduction--I selected these images from the archives of the United States Patent Office. Because patent applications explain something physical, they always include drawings. As a connoisseur and appropriator of found images, I am often found prowling library stacks with my scanner. I am especially drawn to books with leather spines, a sign they may contain beautiful, under appreciated and intriguing images. (Also, their copyright has long expired.) In 2005 I came upon the University of Oregon’s archive of US Patent Office Gazettes, which starts in the 1880’s. These volumes contain millions of images, mostly straightforward technical drawings, but sometimes, reaching into the whimsical, humorous, and poignant. Over a period of months I scanned the drawings that, for whatever reason, caught my eye. I must have gone through a several dozen volumes, but I was only scratching the surface. I focused my search on patents issued between about 1890 and 1960. I put together a small print-on-demand book under the title Apparatus. But I knew there was much more out there. I discovered Google had digitized the Patent Office Gazettes and supported searches using key words; I have supplemented and strengthened the original Apparatus selection from my Google Patent finds. 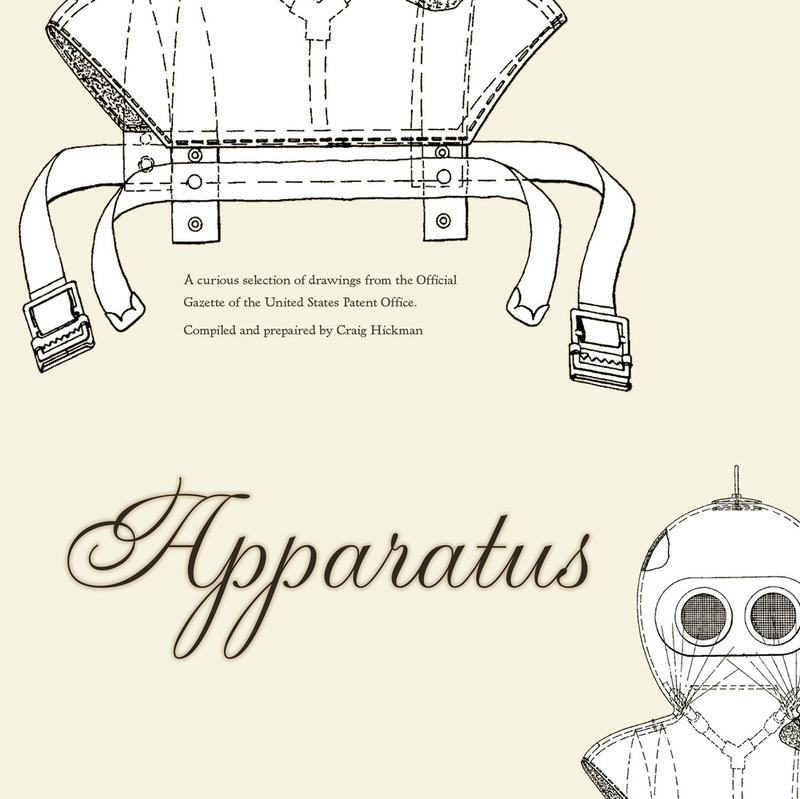 Because my intent was to make a satisfying aesthetic experience for the viewer, rather than convey information about the patent, this book presents patent drawings out of their original context. I felt it would be easier to appreciate the drawings if the original labeling was removed. In some cases I deleted only a few lines and numbers, in others more. If I felt a single illustration had a mysterious quality I pulled it out of a larger diagram. I also composited the images onto a consistent background in Photoshop. I have not listed the names of the original artists because in most cases they are not credited in the patent material. I have included the patent title, year and number, allowing the viewer to do a search for the patent number to view the complete patent application and see the drawing in context if desired.